THOUSAND OAKS, Calif., Dec. 17, 2015 /PRNewswire/ -- Amgen (NASDAQ:AMGN) today announced that the European Commission has approved the use of IMLYGIC™ (talimogene laherparepvec) for the treatment of adults with unresectable melanoma that is regionally or distantly metastatic (Stage IIIB, IIIC and IVM1a), with no bone, brain, lung or other visceral disease. 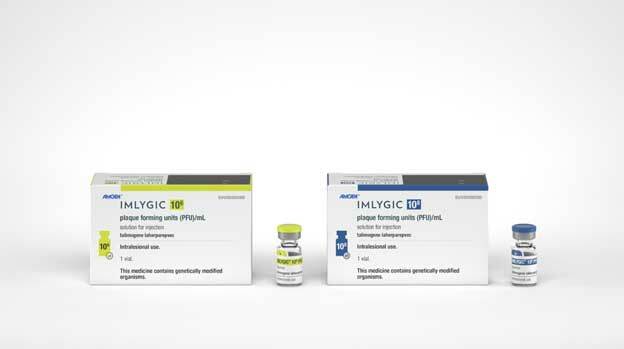 IMLYGIC is the first oncolytic immunotherapy to demonstrate therapeutic benefit for patients with metastatic melanoma in a Phase 3 clinical trial. OPTiM was a global, randomized, open-label Phase 3 trial evaluating the safety and efficacy of IMLYGIC in patients with Stage IIIB, IIIC or IV melanoma when resection was not recommended compared to GM-CSF. In the 436-patient study, IMLYGIC significantly improved DRR, the primary endpoint of the trial, in the intent-to-treat population. DRR is defined as the percent of patients with complete response (CR) or partial response (PR) maintained continuously for a minimum of six months. In the study, 16.3 percent of patients treated with IMLYGIC achieved a DRR compared to 2.1 percent of patients treated with GM-CSF (p<0.0001) in the intent-to-treat population. Of the patients who experienced a durable response, 29.1 percent had a durable CR and 70.8 percent had a durable PR. In the study, the median time to response was 4.1 months (range: 1.2 to 16.7) in the IMLYGIC arm. A key secondary endpoint was OS. In the intent-to-treat population, the median OS was 23.3 months in the group treated with IMLYGIC compared to 18.9 months for those treated with GM-CSF (p=0.0511). These results were not statistically significant. The ORR for patients in the intent-to-treat population was 26.4 percent for those treated with IMLYGIC compared to 5.7 percent in the GM-CSF arm. In an analysis to evaluate the systemic activity of IMLYGIC, 34 percent of patients in the intent-to-treat population had an overall decrease of at least 50 percent in non-visceral lesions that were not injected. IMLYGIC is an oncolytic immunotherapy that is derived from HSV-1, which is commonly called the cold sore virus. IMLYGIC has been modified to replicate within tumors and to produce the immune stimulatory protein human GM-CSF. IMLYGIC causes the death of tumor cells and the release of tumor-derived antigens. It is thought that, together with GM-CSF, it will promote a systemic anti-tumor immune response and an effector T cell response. This product is subject to additional monitoring. All suspected adverse reactions should be reported in accordance with the national reporting system. The safety of IMLYGIC was evaluated in the pivotal study where 292 patients received at least one dose of IMLYGIC (see section 5.1). The median duration of exposure to IMLYGIC was 23 weeks (5.3 months). Twenty six (26) patients were exposed to IMLYGIC for at least one year. The most commonly reported adverse reactions (≥ 25 percent) in IMLYGIC-treated patients were fatigue (50.3 percent), chills (48.6 percent), pyrexia (42.8 percent), nausea (35.6 percent), influenza-like illness (30.5 percent), and injection site pain (27.7 percent). Overall, ninety eight percent (98 percent) of these adverse reactions reported were mild or moderate in severity. The most common grade 3 or higher adverse reaction was cellulitis (2.1 percent) (see section 4.4). About IMLYGIC™ (talimogene laherparepvec) in the U.S. In the U.S., IMLYGIC is indicated for the local treatment of unresectable cutaneous, subcutaneous, and nodal lesions in patients with melanoma recurrent after initial surgery. IMLYGIC has not been shown to improve overall survival or have an effect on visceral metastases. Herpetic infections: Herpetic infections (including cold sores and herpetic keratitis) have been reported in IMLYGIC™ treated patients. Disseminated herpetic infection may also occur in immunocompromised patients. Patients who develop suspicious herpes-like lesions should follow standard hygienic practices to prevent viral transmission. Patients or close contacts with suspected signs or symptoms of a herpetic infection should contact their health care provider to evaluate the lesions. Suspected herpetic lesions should be reported to Amgen at 1-855-IMLYGIC (1-855-465-9442 ). Patients or close contacts have the option of follow-up testing for further characterization of the infection. The most commonly reported adverse drug reactions (≥ 25 percent) in IMLYGIC™-treated patients were fatigue, chills, pyrexia, nausea, influenza-like illness, and injection site pain. Pyrexia, chills, and influenza-like illness can occur at any time during IMLYGIC™ treatment, but were more frequent during the first 3 months of treatment. Please see full U.S. Prescribing Information, including Medication Guide, for IMLYGIC at www.Amgen.com and www.IMLYGIC.com. Amgen has in place a comprehensive clinical development program investigating oncolytic immunotherapies for their potential in melanoma and in a variety of other cancers. A collaboration with Merck on developing IMLYGIC (talimogene laherparepvec) and KEYTRUDA® (pembrolizumab) Merck's anti-PD-1 therapy, in melanoma and squamous cell cancer of the head and neck. A collaboration with Roche on a Phase 1b study to evaluate the safety and efficacy of IMLYGIC in combination with Roche's investigational anti-PDL1 therapy, atezolizumab (also known as MPDL3280A), in patients with triple-negative breast cancer and colorectal cancer with liver metastases. A strategic research collaboration and license agreement to develop and commercialise the next generation of novel Chimeric Antigen Receptor (CAR) T-cell immunotherapies with Kite Pharma. A research collaborative agreement focusing on Amgen's bispecific T-cell engager (BiTE®) antibody constructs with MD Anderson's Moon Shots Program. A research and license agreement with Xencor to develop and commercialise novel therapeutics in the areas of cancer immunotherapy and inflammation. The research collaboration brings together Amgen's capabilities in target discovery and protein therapeutics with Xencor's XmAb® bispecific technology platform. Amgen Oncology is committed to helping patients take on some of the toughest cancers, such as those that have been resistant to drugs, those that progress rapidly through the body and those where limited treatment options exist. Amgen's supportive care treatments help patients combat certain side effects of strong chemotherapy, and our targeted medicines and immunotherapies focus on more than a dozen different malignances, ranging from blood cancers to solid tumors. With decades of experience providing treatments for cancer patients, Amgen continues to grow its portfolio of innovative and biosimilar oncology medicines. This news release contains forward-looking statements that are based on the current expectations and beliefs of Amgen Inc. and its subsidiaries (Amgen or us) and are subject to a number of risks, uncertainties and assumptions that could cause actual results to differ materially from those described. All statements, other than statements of historical fact, are statements that could be deemed forward-looking statements, including estimates of revenues, operating margins, capital expenditures, cash, other financial metrics, expected legal, arbitration, political, regulatory or clinical results or practices, customer and prescriber patterns or practices, reimbursement activities and outcomes and other such estimates and results. Forward-looking statements involve significant risks and uncertainties, including those discussed below and more fully described in the Securities and Exchange Commission (SEC) reports filed by Amgen Inc., including Amgen Inc.'s most recent annual report on Form 10-K and any subsequent periodic reports on Form 10-Q and Form 8-K. Please refer to Amgen Inc.'s most recent Forms 10-K, 10-Q and 8-K for additional information on the uncertainties and risk factors related to our business. Unless otherwise noted, Amgen is providing this information as of Dec. 17, 2015, and expressly disclaims any duty to update information contained in this news release. 1. Boyle P, Doré JF, Autier P, et al. Cancer of the skin: a forgotten problem in Europe. Ann Oncol. 2004;15(1):5-6. 2. Ferlay J, Steliarova-Foucher E, Lortet-Tieulent J, et al. Cancer incidence and mortality patterns in Europe: Estimates for 40 countries in 2012. Eur J Cancer. 2013;49(6):1374-403. 3. American Cancer Society. Melanoma Skin Cancer. Available at: http://www.cancer.org/acs/groups/cid/documents/webcontent/003120-pdf.pdf. Accessed November 23, 2015. 4. Garbe C, Peris K, Hauschild A, et al. Diagnosis and treatment of melanoma. European consensus-based interdisciplinary guideline – Update 2012. Eur J Cancer. 2012;48:2375-90. 5. Andtbacka RHI, Kaufman HL, Collichio F, et al. Talimogene Laherparepvec Improves Durable Response Rate in Patients With Advanced Melanoma. J Clin Oncol. 2015;33(25):2780-8.